The human body’s immune system has amazing defensive capabilities. Without it a common cold or small wound could turn deadly. One of the more important processes of the immune system is inflammation, the body’s ability to isolate diseased or injured tissue from unaffected tissue. Ironically, though, this vital component of the healing process could actually cause harm if it becomes chronic. This often happens with periodontal (gum) disease, an infection of the gums caused by bacterial plaque built up on teeth due to inadequate hygiene, which in turn triggers inflammation. The infection is often fueled by plaque, however, and can become difficult for the body to overcome on its own. A kind of trench warfare sets in between the body and the infection, resulting in continuing inflammation that can damage gum tissues. Untreated, the damage may eventually lead to tooth and bone loss. In treating gum disease, our main goal is to stop the infection (and hence the inflammation) by aggressively removing plaque and calculus (tartar). Without plaque the infection diminishes, the inflammation subsides and the gums can begin to heal. This reduces the danger to teeth and bone and hopefully averts their loss. But there’s another benefit of this treatment that could impact other inflammatory conditions in the body. Because all the body’s organic systems are interrelated, what occurs in one part affects another especially if it involves inflammation. It’s now theorized that reducing gum inflammation could lessen inflammation in other parts of the body. Likewise, treating other conditions like high blood pressure and other risk factors for inflammatory diseases could lower your risk of gum disease and boost the effectiveness of treatment. 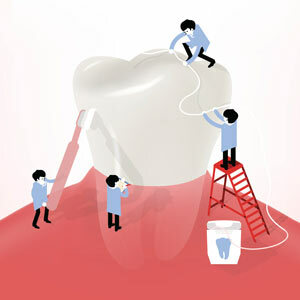 The real key is to improve and maintain your overall health, including your teeth and gums. Practice daily brushing and flossing to remove plaque, and visit your dentist regularly for more thorough cleanings. And see your dentist at the first sign of possible gum problems like bleeding, redness or swelling. You’ll not only be helping your mouth you could also be helping the rest of your body enjoy better health. Is Your Favorite Drink Dissolving Your Teeth?